Nowadays, our skin is exposed to harsher conditions. With harmful rays, a polluted environment and other factors that affect our skin, it’s even more important to look after our skin as best that we can. I’ve always regularly maintained (as best that I can) a daily routine skincare. One routine in the morning, one at night. So today I’d like to share some simple tips that you can pick up right away to help improve your skin. It’s not called the beauty sleep for nothing. We all need enough rest and sleep for our skin to heal itself during the night. A proper, good quality sleep will help improve your skin. Our skin restores its cells when we sleep every day. The skin repairs damaged cells when we are in deep sleep. So the less sleep we have, the lesser our skin is able to recuperate. Being sleep deprived really affects your skin. It is said that your skin ages faster when you don’t get sleep. This is because the skin doesn’t heal properly. And when you lack sleep, it not only affects your skin, but also affects your mood and weight too. The tiredness from a lack of sleep also accumulates so that’s why you can still feel lethargic even if you have managed to sleep for 8 hours. That’s why you need to ensure a regular and healthy sleeping pattern and habit, to ensure your body gets optimal rest. Having good and proper sleep is something you must try and take care to achieve. Take all the usual distractions out of your bedroom, try to fix a consistent bed time, and put away your phone before you sleep. I know, I know, the last one sounds impossible! But try anyway! Having a daily routine skincare is very important. Currently, before I sleep, I normally drink a glass of water and I use a cleanser to wipe my face clean after a long day. After clearing my face with a cleanser, I rinse my face clean so that it feels cool, fresh and hydrated. 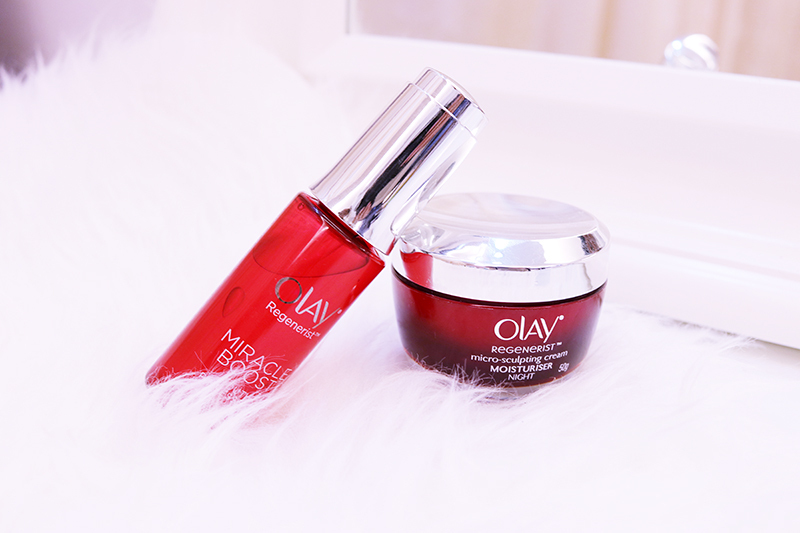 I’m also currently using this awesome product from Olay Miracle Duo line called the Olay Regenerist Micro-Sculpting Night Cream. This Night Cream has a very pleasant fragrance and my first impression on using it is that it felt like smooth butter on the skin. You can feel a smoother and supple skin texture after just a few uses. You’ll also be able to feel your skin becoming tighter and firmer. 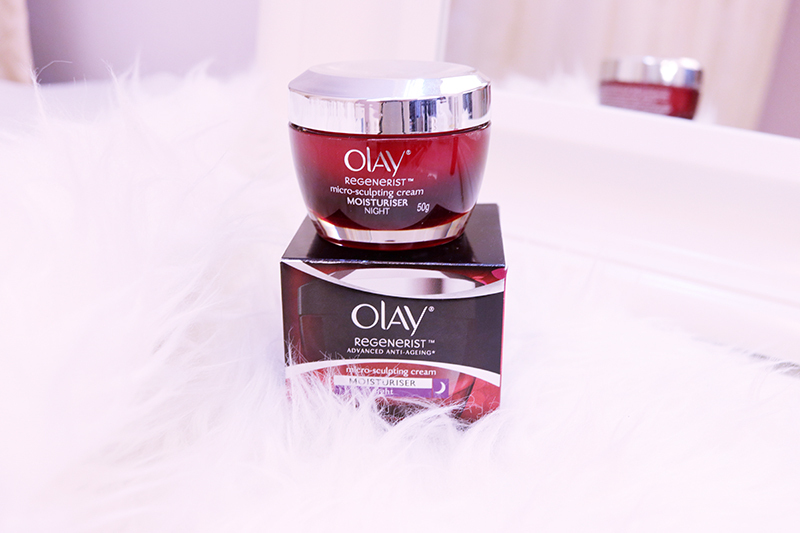 I combine the Olay Regenerist Micro-Sculpting Night Cream with Olay Regenerist Miracle Boost Youth Pre-Essence, which I use before the Olay Regenerist Micro-Sculpting Night Cream. 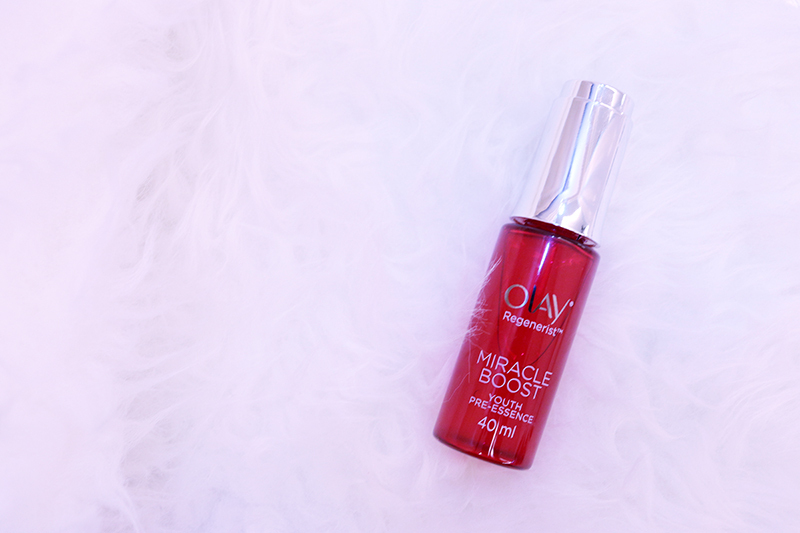 The Olay Regenerist Miracle Boost Youth Pre-Essence stimulates the anti-aging actives in the Olay Regenerist Micro-Sculpting Night Cream which works while your skin is naturally healing itself when you sleep. You can check out their products here. The result when you wake up? A refreshed, firmer and tighter skin. These products are awesome. Of course, I have sensitive skin and need to ensure that the products I use are compatible with my skin. But Olay Regenerist Micro-Sculpting Night Cream and the Olay Regenerist Miracle Boost Youth Pre-Essence are designed for most skin types. For this final tip, it’s already mentioned above. It’s something we all know that we have to do by now, but somehow we just don’t do enough of. I myself am guilty of this sometimes. Now how many glasses a day must we drink water? Some say 6-8 glasses a day. But it’s totally up to you. For me, I try to drink as much as I can without putting a limit or goal to achieve. These tips aren’t meant to be followed rigorously. As long as you know what is the ideal target that you’d like to achieve, and that you’re doing the best that you can to achieve it, then allow yourself some breathing space. It’s perfectly okay. The benefits of drinking water are quite huge and are often understated: It improves blood flow and kidney function which flushes out toxins. You are less likely to be tired, and your skin complexion will also improve. Drinking water also helps regulate your internal organs so that they function better. When the inside is healthy, it will show on your skin too. All by changing your sugary drinks to plain water. One of the most difficult things to do for me as I love sweet our sour juices but I’m trying to make a conscious effort to drink more plain water to reap these health benefits too. So there you are. I shared 3 simple tips that anyone can implement for a healthier and youthful looking skin. The most important thing is to slowly start implementing these tips, and work up to get consistency. Do share with me if you have any other tips that are useful for improving the skin. Hope this is beneficial to you as it also acts as a reminder to myself, first and foremost.